Heat the oil in a large, heavy skillet over medium-high heat. Add the garlic and red pepper flakes and cook until garlic is lightly browned. Add the broccoli rabe and season with salt and pepper. Cook, stirring until tender (6-7 minutes). Stir in the honey and remove to a bowl; set aside. Spread out 4 slices of bread on a cutting board. 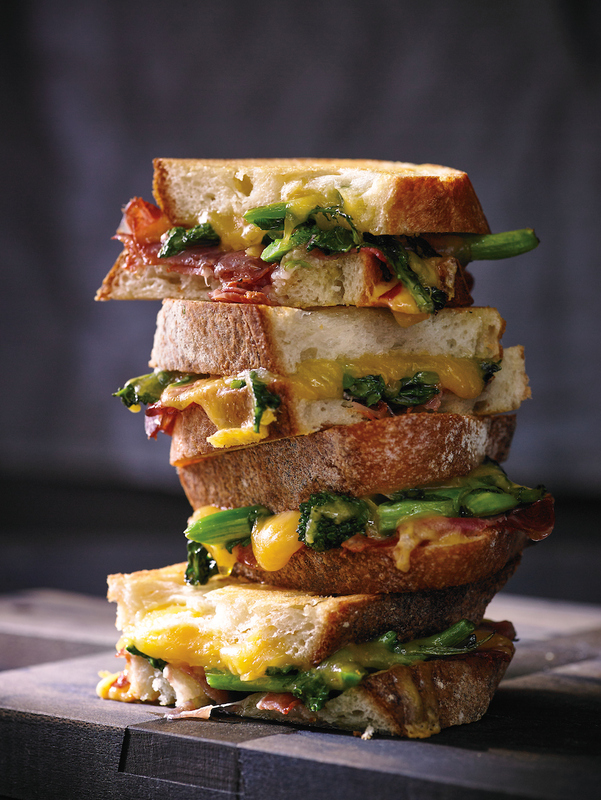 Top with the cheddar cheese, the coppa and broccoli rabe. Cover with the remaining bread and press sandwiches together. Butter the top, outside surface of each sandwich. Using oven mitts, remove one of the hot sheet pans from the oven and place the sandwiches on it butter-side down. Carefully butter the remaining side of each sandwich. Using oven mitts, place the remaining hot sheet pan on top and press down on the sandwiches. Transfer to the oven and bake 8 to 10 minutes, or until the sandwiches are browned and the cheese is melted. Carefully remove from the oven, remove top pan and set aside to cool. Plate sandwiches and serve immediately.